The ace of spades; the highest-value card in spades play. 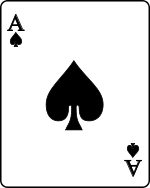 | image_caption = The [[Ace of Spades|ace of spades]]; the highest-value card in spades play. Ин саҳифа бори охир 03:16, 13 августи 2015 дигаргун карда шудааст.